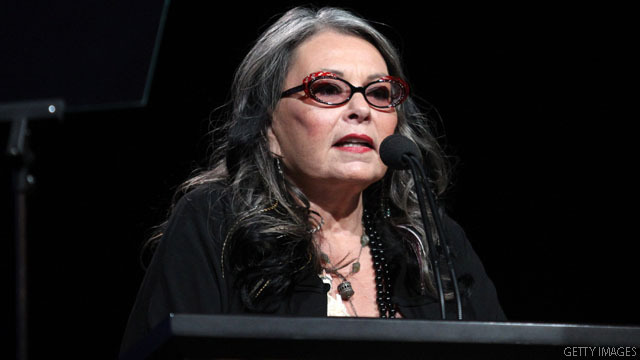 (CNN) - Roseanne Barr for president in 2012? The comedian made her official presidential announcement that was clearly part publicity stunt and part political farce on "The Tonight Show" Thursday night, drawing inspiration from former Alaska Gov. Sarah Palin. "That's kind of what got me to thinking that I too should run for president if she can," Barr told host Jay Leno. "I wanted to edge her out because I feel like she's stealing my act anyway." Barr said Palin, who is flirting with a White House bid, was also her motivation for appearing in a reality show. Her Lifetime show "Roseanne's Nuts," premiered a few weeks ago and follows the former sitcom star running a Hawaiian nut farm. Barr, a former supporter of President Barack Obama, claimed she is "totally serious" about a bid and said she will run as a candidate from the Green Tea Party. No taxes, the forgiveness of student loans and all debts and the use of vegetables instead of money will be the cornerstones of her campaign, she said. "I definitely want to be in the debates and if I'm not accepted in the debates then I'm just going to photoshop myself in anyway," Barr said. "All you have to do I figure to be president is show up and give a speech. And I'm really good at speeches." As for the vetting process, Barr said there's no need because "everybody knows everything about me." Hey! Why not? Give te current crop of GOP/tea party candidates she'd fit right in. She is running republican right? @Erik – its for people like you this country is in a crap hole! The absurdity of Rosanne for POTUS! As much as I don't care of Ms. Palin, I think she would be better than what we have in there now! She could sing the national anthem before each congressional session. She is definitely a better choice than Palin OR Bachmann both laughing stocks. Only qualified for late nite fodder. But..can Rosie's husband cure gays too?????? It makes me laugh when Republicans criticize Barack Obama for the EXACT same things that we criticized Bush for during his terms. "She won't even need the telprompter and you will not see her bowing to any foreign leaders. Terriost are on notice, you don't want to mess with this lady. And best of all I hear she doesn't play golf, so she would have more time to focus on real issues like jobs, economy, debt, deficit, etc." Seriously? I would't vote for Roseanne Barr if she was running for the position of being Roseanne Barr! This woman doesn't even have a high school education and we're supposed to believe that she is a serious candidate?? I cannot imagine ANYONE voting for a puke like this woman who went so far as to make a farce out of our national anthem..............she is about as low as a person can get.........worse than Bella Abzug and that is going deep diving! That she wants to forgive student loan debt is enough to solidify my vote. Go Barr! NO WAY!!! She is a self described SOCIALISTS!!!! Socialism is a FAILURE!! !